Our TEMV family will celebrate two Chanukah events this week: an Intergenerational Shabbat Chanukah service, including turning of our Sunwheel and blessings for all those who celebrate winter birthdays and anniversaries, and a Chanukah celebration with our Muslim friends. Please join us! 5:30 p.m. Tot Shabbat for families with young children. 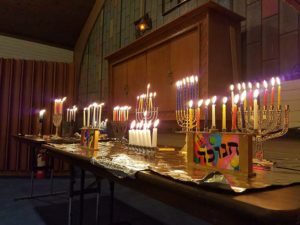 6:00 p.m. Community Potluck Dinner, beginning with lighting of Chanukiot (menorahs) and Shabbat candles. RSVP to potluck@temv.org. 7:00 p.m. Intergenerational Shabbat Chanukah service, including turning of our Sunwheel and blessings for all those who celebrate winter birthdays and anniversaries. Sunday, December 17, 10:30 a.m. SHARP to 1:30 p.m. Location will be sent upon RSVP. Many of you will remember the wonderful Iftar program we jointly hosted with Peace Islands Institute and the Islamic Society of Greater Lowell, whose members visited TEMV with gifts of food, insight, and friendship during Ramadan this past spring. The TEMV community happily obligated ourselves to reciprocate, and have committed to doing so this week. All members of the TEMV community, including our religious school families, are enthusiastically encouraged to attend. Please plan to join us and help uphold our commitment to interfaith friendship and sharing. There will be a host of activities, including song, dance, and discussion led by Rabbi Sparr and Mr. Olsen Turin, vice president of Peace Islands Institute, and a kids’ craft activity led by the Education Committee. We’ll conclude with an integrated dairy/vegetarian lunch, and head back to Lowell after clean-up (around 1:30). Rabbi Sparr is available for office hours on Wednesday and Friday this week by appointment. She is generally available via email at rabbi@temv.org, and can also be reached during business hours at 508-736-5555. In case of any urgent need or emergency, please do reach out regardless of the hour. In session. All students and families are expected to attend our special program with Peace Islands Institute (see above). If you will be unable to attend, kindly let Rabbi Sparr know. Wednesday, December 13, 7:00 p.m.
All welcome. Note this is on Wednesday, a change from our usual Thursday date. We are looking for lay leaders for Shabbat services on January 12 and Feb 16th. Please contact Karen if you are able to do so. We need Oneg hosts for the following dates. Please contact Zach Frisch if you can volunteer for any of them. Thank you! All times are service start times except when noted as Pre-negs.